It's always fun as well as very interesting to find growing in the wild a plant that we buy when back at home in order to have it in the gardens! Aubrieta is one of our favourites. It manages to bloom early, even in gardens in the UK, and this is because, in the wild, it grows high up in the mountains and is used to inhospitable conditions like the English spring, which punishes so many of the other early-flowering plants. 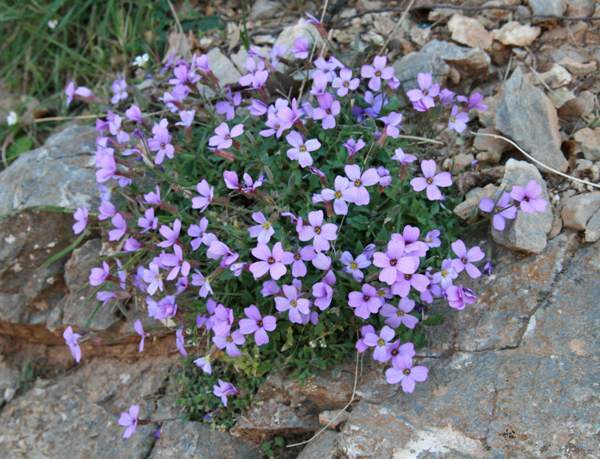 This neat plant with its beautiful mauve flowers can be found in Crete, where the plants shown on this page were photographed. We have also seen wild Aubrieta in the Gargano Peninsula in Italy. Aubrieta deltoidea grows in rocky habitats high up in the mountains, where it forms pretty cushions of flowers from March to early June. Aubrieta, the genus name, honours the 17th century French artist Claude Aubriet, who had held the post of Royal Botanical Painter at the French Royal Garden. The specific epithet deltoidea means triangular (shaped like a delta). 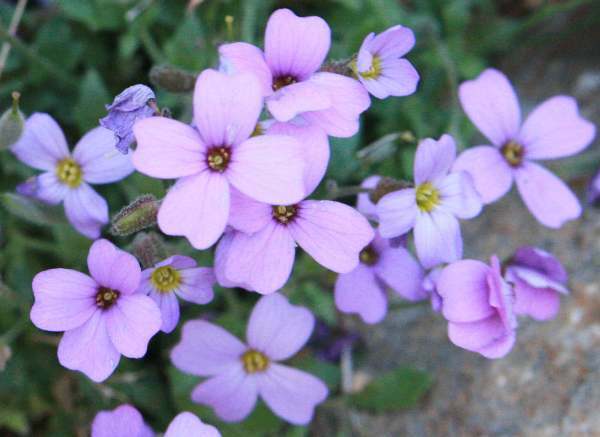 In the past the common name given to this flower was Aubretia, but nowadays Aubrieta, spelt exactly as in the genus name, is more commonly used.